I am humbled for your love for freedom. And I pay respects to the distinguished personalities who have joined us in solidarity with a free Iran and freedom for Iran from five continents around the world. Last year this time, the religious dictatorship ruling Iran was launching missiles at Camp Liberty to slaughter the members of the Mujahedin-e Khalq (PMOI/MEK). Now, with their victorious relocation from Camp Liberty Prison in Iraq to Albania, it is the Resistance that is advancing and on the offensive vis-à-vis the regime. We are all jubilant and proud to have PMOI members and officials in Albania joining us in this gathering just now. First, the relocation of thousands of MEK members out of Iraq which foiled the mullahs’ supreme leader Ali Khamenei’s scheme to annihilate the Resistance movement. Second, the failure of the policy of appeasing the regime by the United States and Europe. And third Khamenei’s defeat in the sham elections, which means the defeat of the regime in its totality. By staging the elections sham, Khamenei planned to counter social uprisings and contain tensions within the regime. For this reason, he picked mullah Ebrahim Raisi, a member of the Death Committee in charge of the 1988 massacre of 30,000 political prisoners. Society’s readiness for an uprising, however, led to his defeat. 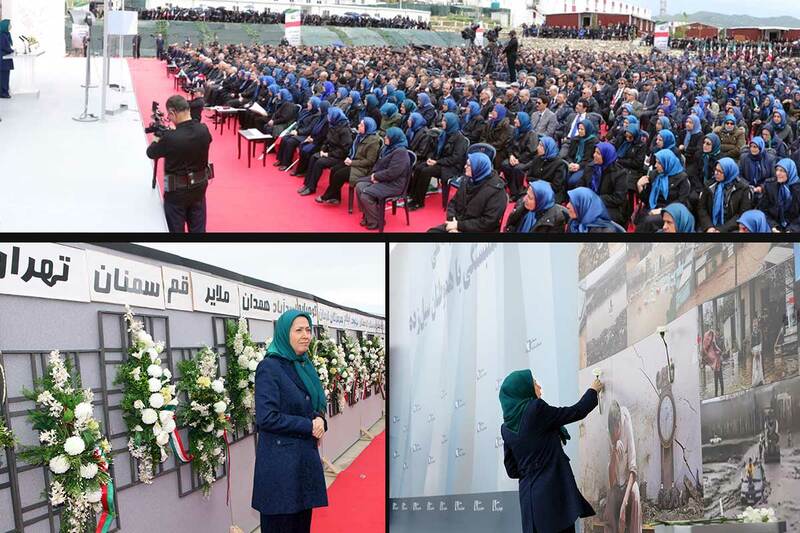 This readiness against the totality of the regime was prompted by the campaigns of Iranian Resistance forces and supporters about the 1988 massacre, exposing Raisi’s background, and calling for the boycott of the sham elections. Hundreds of articles and interviews appeared in the state-run press and media to justify the massacre and Khomeini’s fatwa on the massacre was published for the first time 29 years after the massacre. Khamenei’s representatives were saying that the MEK has resurfaced in the country. Intelligence and security officials were repeatedly boasting of the arrest of MEK members, who were attempting to sabotage the election. In the final days before the election, Khamenei, cognizant of the volatile state of society, had to back down from his plan because he feared a repeat of the 2009 uprising. Raisi’s candidacy was an attempt on the part of Khamenei to break out of an impasse. That Hassan Rouhani secured a second term does not change the status quo. Despite vigorous power struggle with the rival faction, Rouhani is complicit in all of the regime’s crimes against the Iranian people. By “engineering” the election and fabricating the vote tally, the mullahs claimed more than 70 percent of Iranians had voted for their own executioners. A month later, however, the Assembly of Experts issued an official statement in which it declared that under the mullahs’ Islam, “people’s vote, demands, and views” have no importance whatsoever. With this election, the mullahs had intended to improve the regime’s situation. But they divided and destabilized the regime. Now, they are planning and threatening to oust Rouhani. By slandering the Mojahedin (PMOI/MEK), they sought to set the stage for bringing to power an executioner. But they failed again and showed how much they fear the MEK and the Iranian Resistance. So, to the ruling mullahs, we say: Do whatever you can; say and make up whatever you want against our movement in your Friday prayer masquerades, but beware that the same people for years whom you claimed had been annihilated, are present in the scene and have come after you. The same people you hanged and whose graves you concealed, have risen again as a new generation of rebellious youths who, with their calls for justice, have encircled your regime. The nooses you tightened around the necks of Iran’s valiant youths, have turned into rings of fire from which you have no escape. Three fundamental truthsThe winds of change have started blowing in our homeland. The ruling regime is in disarray and paralyzed as never before. Iranian society is simmering with discontent and the international community is finally getting closer to the reality that appeasing the ruling theocracy is misguided. The same volatile situation speaks to three fundamental truths for obtaining freedom in Iran, and peace and tranquility in the region. First, the imperative of overthrowing the ruling religious dictatorship. Second, the regime’s overthrow is within reach. And third, a democratic alternative and an organized resistance exists, which is capable of toppling the theocracy in Iran. Now, what do these words mean? The first truth answers the question of what must be done to a regime which has held Iran and all Iranians in chains and is the force behind war and carnage in the region. Is this regime ever capable of reform? The answer is NO, because claimants of reform were in office for 20 out of the total 38 years of the regime’s rule and they did nothing but serving the Velayat-e Faqih regime. Would giving concessions ever change the behavior of this regime? The answer is NO. This is something that has been already tested repeatedly for the past three decades by the US and Europe. And is it possible to contain this regime? NO, the policy has been called containment, but in effect, it does nothing but obstructing the adoption of a firm policy against the regime. The conclusion is what the Iranian Resistance has emphasized since the outset and many in the world have reached today: The solution, and the only solution, is regime change. The second truth is that the regime’s overthrow is possible and within reach. Because the regime is besieged by extensive social discontent. As one of the commanders of the State Security Force has acknowledged, nearly 11,000 protests and demonstrations took place in Iran last year. Look at those grave dwellers, the 10-million unemployed, the 20-million shanty-town dwellers and the 30 percent who are starving. The mullahs are encircled by these very people. The hand-picked candidates for the sham presidential election admitted that this is a regime of the 4 percent and that 96 percent of the people despise it. Indeed, despite the regime’s deafening propaganda, the greatest threat to the regime is not a foreign enemy, but the very revolts in society, waiting to erupt. The reality is that the overthrow of the religious dictatorship is possible and within reach because of the regime’s incompetence, including its inability to contain the country’s economic disintegration and environmental disasters, the inability to provide for the most basic needs of our enraged people, its inability to obtain nuclear weapons, and its failure to consolidate the regime. Regime change is within reach because the mullahs have gotten themselves stuck in three wars of attrition in the Middle East. Their withdrawal from these conflicts in whatever form or shape will undermine their own existence. Since last July, the Iranian Resistance has hoisted the banner of seeking justice for the victims of the massacre of political prisoners 29 years ago, turning it into the main focus of political discourse in Iran today. In the recent sham elections, our slogan of “No to the executioner, no to the charlatan” was widely embraced by the public such that Khamenei was furious about why the place of the executioner and the victim have been switched. Yes, the time has come for exposing the executioners until the day when they will be held to account before the Iranian nation. But, what force is this alternative relying on? It is relying on an organized and united movement with thousands of trailblazing and selfless members. It relies on the genuine support of Iranians at home and abroad and the tireless efforts of its dedicated supporters. It is relying on political prisoners, who reaffirmed their support recently for this gathering from the depth of their cells and dungeons. It is relying on women, workers, teachers, professionals, and selfless youths. It is relying on their unsparing love and generous support, those who barrow money and sell their houses and properties to help keep this Resistance independent, strong, and solidified. With the efforts and the audacity of members of the Iranian Resistance, we could expose the mullahs’ secret nuclear sites while no other government had any information about them. Indeed, why is this alternative reliable and trusted? Because we have always stood by what we have said and promised. Not a day goes by without the movement fighting relentlessly for the cause of freedom. Some 120,000 members and sympathizers of this movement have been executed, and the movement has been subjected to massive repression and a continuous barrage of propaganda since June 20, 1981; the mountains wavered, but your Resistance movement remained steadfast. And it will not relent until it uproots the medieval mullahs’ Caliph, Khamenei. In the mythologies of Ancient Persia, Kaveh, the ironsmith, is renowned for his bravery and the flag he hoisted. When oppression and injustice had taken over the land, he was the one who provoked the nation to rebel and rise to resist. Arash put his life in an arrow which travelled a long distance to set Iran’s border line. Siavash passed through fire to prove his purity and innocence. Now, our Resistance has resurrected Kaveh, Arash and Siavash in itself. It will pass through fire and it will make the ultimate sacrifice to empower the arrow to tear asunder the chains in Damavand mountain and liberate Iran, to turn Iran into a flourishing garden of freedom and justice. When a nation offers a political alternative, it means that it has acquired a major asset in the quest for freedom. Therefore, in its battle with the beast of religious tyranny, the Iranian nation is proud to have created a democratic alternative through resistance and great suffering and sacrifice. This decisive asset, a guide marker, did not exist at the time of the Shah. Otherwise, Khomeini could not have hijacked the Iranian people’s 1979 Revolution and turn it against them and the peoples of the region. However, Massoud Rajavi, the leader of the Iranian Resistance, challenged Khomeini and his Velayat-e Faqih regime. With a call for freedom, he founded the democratic alternative and the Liberation Army. When Khomeini was destroying everything, he confronted the religious fascism, by organizing the progressive, anti-dictatorial fighting force, which blossomed with the formation of the National Council of Resistance and the National Liberation Army of Iran. He initiated an anti-fundamentalist movement in the region. Through perseverance and with great risk at every step of this half-a-century struggle from Evin to Ashraf, he revived and blossomed an invincible and trailblazing generation in the fight to free Iran. Today, Iran’s freedom-fighters have gathered in Ashraf number 3 in Albania. It is common knowledge that after 29 ground and air attacks on Ashraf and Liberty, their miraculous flight out of fire and blood has not come easy. Their glorious endurance in Ashraf and Liberty, and their safe departure out of concrete walls and surrounded by the Quds Force and ministery of intelligence agents were made possible during more than 70 meetings and briefings as well as messages issued by Massoud Rajavi in the final year before Camp Liberty was evacuated. If it weren’t for his actions and guidance five years ago after the first missile attack on Liberty, the number of those killed would have multiplied several-fold. Indeed, this is how the democratic alternative survived and blossomed. And this is how our Resistance has kept alight the flame of hope for victory and freedom. Our unwavering belief in universal suffrage and the people’s free choice, our commitment to the separation of religion and state, our emphasis on women’s active and equal participation in political leadership, and our defense of the autonomy of various ethnic groups in the framework of Iran’s territorial integrity and our people’s democratic aspirations for a free Iran in the future, represent significant parts of the democratic alternative’s wherewithal. 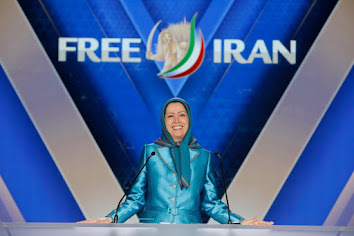 You know that the main demand of this democratic alternative is freedom and democracy for Iran, but the Iranian Resistance is also known for its staunch and persistent opposition to the policy of export of terrorism and fundamentalism. From the outset, the regime was at war with the people of Iran. All the other wars waged against foreign countries were designed to cover up this main conflict. These wars are not a sign of the regime’s strength. The problem is that no government in the region has ever attempted to prevent the regime’s belligerence. Two years ago, everyone saw that the clerical regime suffered a defeat at the hands of the Syrian opposition forces. If it were not for foreign airstrikes, the regime would have been evicted from Syria altogether. Likewise, today, the Iranian regime lacks sufficient power to mobilize and send Iranians to Syria. It has put the country’s economy at the service of war in the region. Out of the past 38 years, the mullahs were engaged in war with Iraq for eight years, have been at war with the people of Syria for six years, and have pursued confrontation with the international community for more than ten years to build an atomic bomb. Our demands reflect the demands of Sattar Khan, revered leader of the 1906 Constitutional Revolution, and Dr. Mohammad Mossadeq, leader of Iran’s Nationalist Movement in 1950s. As I have reiterated, repeatedly, we want neither money, nor arms. We say that the struggle of the people of Iran for regime change is legitimate, righteous and imperative. We urge you to recognize this “resistance against oppression.” The same notion that is stipulated in the Universal Declaration of Human Rights and in France’s Declaration of Human Rights and Citizens’ Rights. This has also been stated in the American Declaration of Independence where it says, “whenever any Form of Government becomes destructive of” the people’s rights, “it is the Right of the People to alter or to abolish it, and to institute new Government” of their liking. Yes as Massoud Rajavi said: “Struggle and resistance for freedom are absolute rights of the Iranian people at any situation”. And the Iranian Resistance is determined to uproot the regime which the people of Iran despise. We have welcomed the statements made at the Arab, Islamic, American Summit in Riyadh against the Iranian regime’s terrorist and destabilizing activities. Nevertheless, we emphasize that the ultimate solution to the crisis in the region and confronting groups like ISIS, is the overthrow of the Iranian regime by the Iranian people and Resistance. Recognize the resistance of the Iranian people to overthrow the mullahs’ religious dictatorship. Expel the regime from the UN and the Organization of Islamic Cooperation, and hand over Iran’s seat to the Iranian people’s Resistance. Designate the Islamic Revolutionary Guards Corps (IRGC) as a terrorist organization and evict it from the entire region. Khamenei and other leaders of the regime must face justice for flagrant violations of human rights and their crimes against humanity, particularly the 1988 massacre of political prisoners in Iran and for their war crimes in the region. Dear compatriots, I rely on your enormous power, on your restless quest for freedom and equality. I count on you, the women and youths of Iran, the Kurds, the Balouchis, the Arabs, Azeris, Turkomans, Lors and Bakhtiaries. There is a power in you that has made the ruling dictatorship desperate in the face of your resistance and protests; there is a power in you which can definitely overthrow the religious fascist regime. Yes, the time has come to go on offensive and march forward. The time is up for the mullahs. The time has come to erect 1000 Ashrafs, as bastions of rebellion, and the Army of Freedom. So, rise up! Rise up, the children of Iran! Onwards to freedom and popular sovereignty.